The 2015 Oregon State AIAA team at the Intercollegiate Rocketry Engineering Competition held in Green River, Utah. 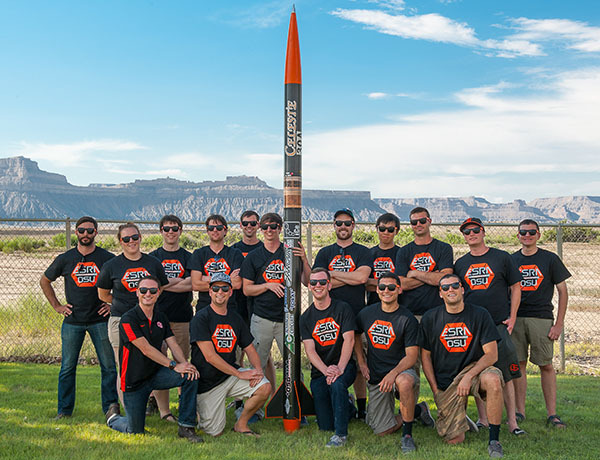 For the second year in a row, the Oregon State University’s branch of AIAA (American Institute of Aeronautics and Astronautics) took first place in the payload competition at the Intercollegiate Rocketry Engineering Competition held in Green River, Utah. The team also placed third in the overall competition in the advanced category that targets an altitude of 25,000 feet — their launch reached 17,611 feet and a maximum speed of Mach 1.4. The competition, hosted by the Experimental Sounding Rocketry Association (ESRA), had 41 rockets launched this year by 36 different colleges representing seven countries (Australia, Brazil, Canada, Egypt, India, Turkey and the U.S.). Oregon State’s team stood out in the competition for building nearly all of the components themselves. In fact, computer science student, Soo-Hyun Yoo said he had a hard time getting the judges to notice the extra work the team put in. “All of the other teams at the competition had an aerospace program and bought off-the-shelf components. There were a very limited number of teams who built their own software and electronics and so very few people were asking about those things. I had to try really hard to make sure they realized the significance of having our own system that we can build on and modify to fit various needs,” he said. Yoo said that a few of the payload judges were very excited about their original components and it was what likely earned them the payload award again this year. The award is prestigious because it includes all the teams in the competition from both the basic and advanced categories, and comes with a $700 prize. Since the award has been offered just two times, Oregon State is the only team to win it. Going, going, gone. 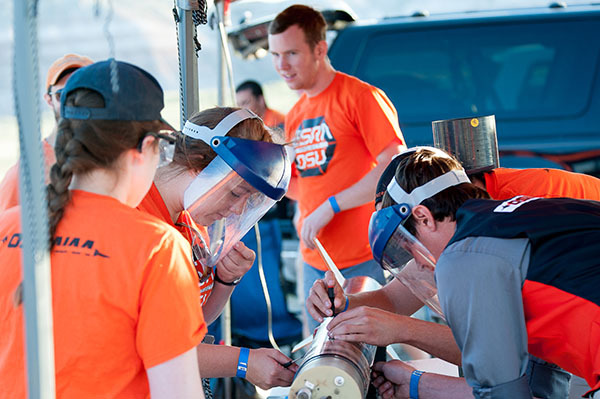 Oregon State took first place in the payload competition and placed third in the overall competition for the advanced category at the Intercollegiate Rocketry Engineering Competition. The payload is the main purpose of sounding rockets, which are designed to conduct scientific experiments. The Oregon State team built a deployable payload in the nose cone of the rocket that deploys at the highest altitude and uses propellers to accelerate downward to counteract aerodynamic drag force and achieve microgravity in order to conduct experiments in a zero gravity environment. The OSU team toggles the external power buttons to physically arm the electronics in the rocket. The ‘live’ circuits are connected to black powder ignition charges, hence the protective face masks. The ground station engineers attempt to make a radio connection with the transmitters in the rocket from 750 feet away. The receivers needed to be elevated in order to make the connection. This year’s team built significantly on the success of last year’s rocket which won the basic category (targeting 10,000 feet) in 2014 at their first competition. Four sub-teams contributed to this year’s rocket: a payload team, a structures team, a propulsion team, and an aerodynamics and recovery team. 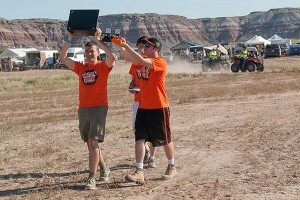 At Oregon State’s 2015 Engineering Expo the payload team won the industry award for electrical and computer engineering and earned honorable mention recognition for the Boeing Engineering Excellence Award. Elliott Fudim, an electrical and computer engineering student who joined the club as a senior, hopes that other students will discover the club sooner than he did and have more years to advance the rocket. “It’s a once-in-a-lifetime opportunity. It’s one of the coolest things I’ve ever been a part of. 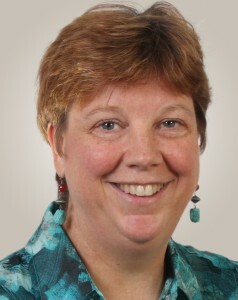 And it’s important to keep on setting the bar higher,” Fudim said. Both Fudim and Yoo said that aside from the cool factor of being able to build a rocket, the experience of working on a cross-disciplinary team was more realistic to what they will experience working in industry. Additionally, working on a rocket that deals with extreme conditions such as speed and temperature offered interesting challenges. “The limited test cycle in which we only get a few chances to launch and the cost of failure is high, was a learning experience. Getting it right the first time was stressful but also exhilarating,” Yoo said. The team performed on-ground tests of the various systems and also practiced their launch setup to make sure everything went smoothly on competition day (view photos). Their only full-flight test was performed in Brothers, Oregon near Bend where they could secure a waiver from the FAA for air space. For future competitions, the club has begun developing an experimental hybrid rocket motor. The current rocket is a solid propellant rocket with a simple ignition – “you light it and it just goes,” explained Yoo. The hybrid rocket will have a throttle to adjust the thrust depending on need. This year’s team was able to compete with the support of their sponsors: Advanced Circuits, CadSoft EAGLE, and the College of Engineering at Oregon State. “We couldn’t have done this without them,” Fudim said.